Popular site! Thanx so much for what you nd your family have been doing. I, too, have a relation from Waipawa, who I gather must have attended the school. Her name ((my grand-ma) was Eliza Blytha Cooper, born on the 8/4/1880, which should mean that she was at school in or around 1886. Her parents were Albert and Emily Cooper. Really, anything that you can find would be helpful: perhaps school photo's or internal records. Again, many thanx for the work you guys are doing. It is valuable! I just got your email this morning - having flown back from China last night... So I'm still feeling a little jet-lagged. Anyway (even though I'm not feeling at my intellectual best) I still have a feeling that there is information down at the Museum about the Coopers... maybe a few photos - but its a while since I've worked down there and maybe my memory is playing tricks on me. So I will forward your email to Rosheen (the museum curator) and see if she can run your family names through the data base and maybe do some looking around for anything else relevant. Hopefully something will surface - and I'll get Brian to put this on the website when he gets back from China (in another week) so that maybe if any information does come to light it can go on there - and maybe be added to by anyone else who has relevant information. 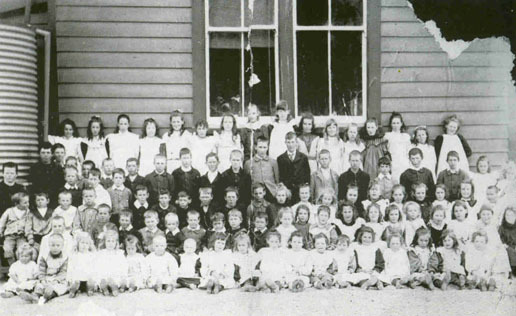 Our school records only start from 1897 - so no luck with those or with photos. The electoral roll 1893 has two listings for Albert Harry Gooding Cooper no's 650, Waipawa & 789, Pahiatua, farmer - no listing for Emily. Perhaps he had land in both areas - which might point you in another direction. I have no marriage or death records matching any of the make names which suggests they may have moved on from Waipawa. All the best with the research. Well Rosheen tells me she's had an extensive search around the Museum and can't find very much about your family. By now you should have received her email - and I probably got your hopes up thinking there might have been a photo or two. My fault... obviously its the onset of my memory vanishing. Sorry about that. Sorry we couldn't help that much.... But we'll put your enquiry on the website and see if anyone out there can?